Before I dig into some of the nonsense that’s floating around the internet, let’s consider a few facts. 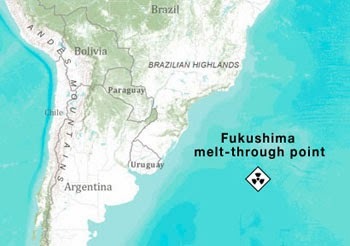 The earthquake and subsequent meltdowns of the Fukushima reactors took place in March 2011. That’s almost three years. Radioactive isotopes decay into stable isotopes, which means the radiation is decreasing with every day that goes by. The most dangerous – hottest radioactively and thermally – also have the shortest half-lives, of days or months. The thermal heat comes from the radioactive decay, and a short half-life means that lots of atoms are decaying all at once. So the worst ones go away fastest. 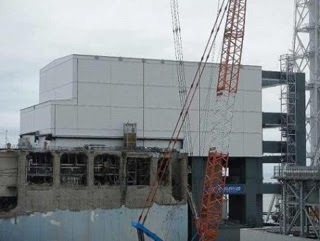 Additionally, the buildings have been stabilized (one example, from which the top photo is taken), and the spent fuel in Unit 4, which so many are so worried about, is being removed successfully. Here’s an animation of how it will be done. It turns out there was water in the pool all along (see video in first link), even though there was a question about that back in March 2011. More here and here. So all stories about how the spent fuel pool is going to flame up and kill us all are nonsense. Another report that I’ve seen over the past couple of weeks is that steam has been seen rising from Unit 3. At first, I thought this was just mist rising over the water, which has obviously been the case in videos from 2011, but Tepco has said that it is rain water evaporating from the containment vessel, which is still warm. Unfortunately, I don’t have links because this is coming from a Facebook discussion. I’ll update as I get more. In any case, I’ve seen radiation measurements reported as showing no significant radiation in the steam. Update: A Tepco press release confirms the explanation in the previous paragraph. Via Hiroshima Syndrome. And the zombies get weirder. Take this compendium of scary things that someone wants to blame on Fukushima. I wrote during the last zombie invasion that the contaminated water being dumped in the Pacific would be diluted to undetectable before it got a few miles out (check out the comments too). That is relevant to a number of these claims – #s 2, 5, 6, 7, 8, 9, 10, 11, 12, 13, 14, 15, 16, 17, 18, 21, 22, 23, 24, 25, 26, 27, 28, 29, 30, and 31 to be exact – making them trivial, mistaken, or outright lies. There are duplications in that list – the numbers of becquerels going into the sea, and the use of the becquerel unit will always give immense numbers for rather small amounts of radiation. And there are other problems in that list. For #1, we don’t know who did these measurements, what equipment he is using, whether he knows how to use it, or if he is just plain fabricating them. If he is being honest, it’s possible he doesn’t know how to use the equipment. It’s not uncommon for moisture in the air to affect radiation meter measurements. There’s no indication the “independent researcher” knows that. And that phrase, given in plural, makes it sound like the anonymous videotaper is one of many. No evidence for that. At this point, having debunked 27 out of 36 claims, I think it’s justified to find this not a reliable reference. Deep Sea News is a very good website that debunks, in detail, a number of those claims. Plus all those scary maps of deadly radiation s p r e a d i n g across the Pacific. Is the sea floor littered with dead animals due to radiation? No. Three Reasons Why Fukushima Radiation Has Nothing to Do with Starfish Wasting Syndrome. I suggest checking Deep Sea News whenever you hear that the Pacific Ocean or California or Alaska is under siege by Fukushima radiation. Woods Hole Oceanographic Institution is also providing factual information. Update: Monterey Bay Aquarium Research Institute weighs in. Even more brain dead is the report that there were two underground nuclear explosions on December 31, 2013. Of course, it’s not persuasive that the people at this website know what they’re doing, since they use one of those debunked “radiation” maps. The story also shows up on the Iranian news site FARS. It seems to have originated here. The information is from Sister Sorcha Faal, which should be a clue as to credibility. But if you see the report somewhere else, you might not know about Sorcha Faal. So let’s look at some science. The Washington Post recently published a very nice article about the Comprehensive Test Ban Treaty Organization’s International Monitoring System, which is specifically designed to monitor underground nuclear explosions. But everyone is keeping it secret! Probably not. A great many universities have seismographs and would be only too happy to be the first with the news. Nuclear explosions have a unique seismic signature, not at all like an earthquake. And they’re hard to contain. So there would have been a cloud. I particularly like the “Fukushima melt-through point” in one of the illustrations in that apparently original source, reproduced here. That’s referring to the China Syndrome, in which the melted reactor core melts down through the earth. But once it gets to the center, does it keep climbing, against gravity, to that “melt-through point”? How much outrageous or stupid stuff does it take to discredit a source? For me, the misuse of the tsunami map and the belief that a core could melt clear through the earth, against gravity, are quite enough. Leaving out that the Ronald Reagan is a nuclear aircraft carrier. Considering only the very worst interpretation of an observation. And it helps to know something about radiation. Here’s an easy to understand fact sheet on the basics. Finally, in searching for links for this post, I found that there is an almost inconceivable volume of fearmongering garbage on the internet and, far worse, that Google is willing to call it “News.” I have been aware of what was going on at Fukushima mainly from links served up by my Twitter feed and thought it would be easy to find them again. Sadly, no. Google is not a reliable source of news, at least on this topic. If you would like to follow only one reliable source of nuclear news, I suggest World Nuclear News (@W_Nuclear_News). Nuclear Diner (@NuclearDiner) retweets WNN and other sources, but we don’t catch them all. First posted at Nuclear Diner.